Amy Chomas: Chomas Creations engraving tip guest post! Karen Hamski was nice enough to add this post with even more information on engraving with the Chomas Creations engraving tip and the Ohax Industries, Inc aluminum tags! 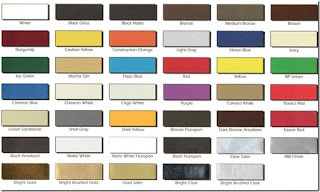 Order a sample pack today with 21 tags for just $10.75, price includes shipping here... sample pack. So everything you see below is done by Karen and she was kind enough to let me share it here! Along with how to make your own engraving fonts! 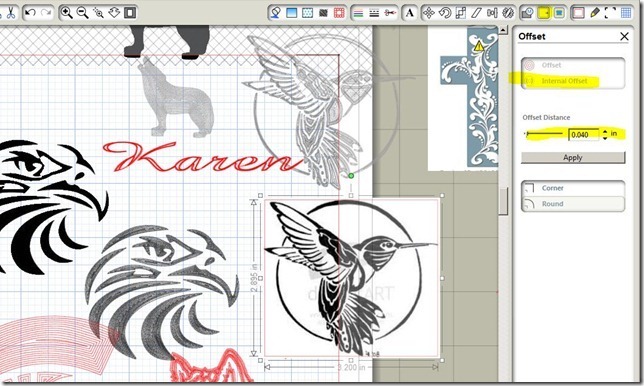 Here are some samples of what Karen has done so far! 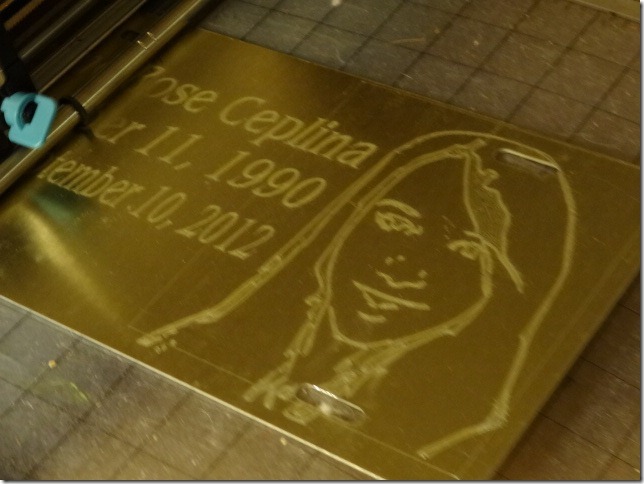 This is my method, for converting graphics and lettering for engraving. NO NEED TO HUNT THEM DOWN…I wish I could tell you the hours I spent trying to get fonts or graphics for engraving, hours and hours of googling, until in the middle of the night I woke up last weekend and the “lights came on”, it was so simple and it is so cheap. Engraving fonts can be extremely expensive and now you will have your computer fonts at your disposal. Not all will work but keep trying; you will find your favorites. First you need to get your shape templates on your mat on the screen, this will work for most basic shapes. 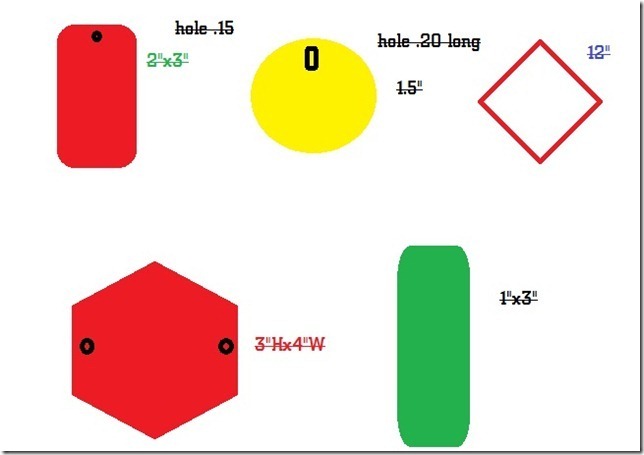 Amy Chomas has come up with a method for more involved shapes, really very clever lady, and for those not confident in making their own shapes and sizes using Sil tools. Right now we are limited to squares, rectangles, octagons, ovals and circles, if he sees this part of his business growing he will add more choices in all areas and purchase the needed equipment. When you get your tags, plates or signs, you will either measure them and just use the tools to draw them, on the mat and make the holes where you need to, MAKE SURE U TURN OFF THE CUT LINES ON THESE SHAPES…they are your templates and won’t be getting cut, you will be placing your lettering and graphics on the template and these will need cut lines but not the templates themselves...if you don’t feel confident to do it that way, Amy’s way is longer but so much safer…you will need a scanner. 2 If your graphic is surrounded by white trace and detach your graphic, remove the white areas and delete the white (not the graphic...lol) then trace your graphic again but make sure u have a thin lines, if you let the yellow line become too thick than you will have more lines than u need and will be doing a lot of editing to get rid of them. 4 Make sure u have your traced graphic highlighted or clicked on, go to Off Set most of the time u will be doing internal off setting. This is what I learned. When it starts and you say internal it will default at 40 you now have 3 choices, 1 to go to a smaller number which will make all the engraving lines closer together, 2 keep it at 40 or 3 go a bigger number so the lines are spread out more. I have yet to find a reason to use bigger or 40. Now just incase you are like me and a novice at off setting, I will go into more detail…if you want the lines to stay the same distance apart, just keep using the same number. I seem to stick mostly around 10-15, unless I am just trying to get an outline well defined then I will go to 5. Here is the tricky part, after each trace you will hit internal off set again and again it will default to 40, (this is a swearing point after several off sets on a design...PITA) Ok so if you started by going down to 10, then on the next one you will want 10 again so the lines stay spaced evenly. Here I changed the number for 15 and then started doing 4 and the lines were closer and there for produced a different affect. When you go for the second pass and all passes after that the program will go to 40 and you will see that the selected area is no longer taking up the full graphic. What is happening is the program is showing you the areas that can still be traced at 40 however, soon as you lower the trace number more and more areas becomes highlighted because you are defining that your lines are closer to the last trace and now the program is finding other areas in your graphic that another trace will fit into. Now you will keep repeating this same thing until you have it filled in or to the level you want it filled in. I found with some fancy lettering I liked a good engraving around the edge of the letter but wanted the centers of letters to be shinny and not engraved. We have a saying in knitting…Knitter’s Choice here you have Designer’s Choice and what you like, there is no right or wrong. If you use a font that requires it to over lay like in cursive then you will want to hit the weld on the lettering so the letters are not being cut apart. Ok now that you have it all traced and ready you must GROUP or you will be dragging lines all over the place…ask me how many times I forgot to do it and thank goodness for UNDO. Once you get it all grouped and happy you can shrink it down to the size you want to engrave and make sure it fits in your template. 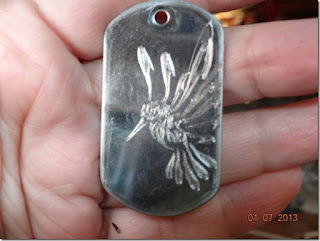 Then the next trick is to make sure you place your tag or whatever you are making in the same spot on the mat, that you see it on your screen, this is where Amy’s method rocks…ask me why the cross on this one is off the tag! Do not put your tags too close to where the rollers are, I found putting them in the center lengthwise and not letting them interfere with the rollers worked great and no problems. When working with the license plates, feed them short side first they go out to the back pretty far, and the weight tips them down in back, I didn’t but I think from now on I will put something flat back there so when the mat slides back there the top of the license is supported and not dipping down. I did do a bunch and no problem BUT, why ask for one. I found most of the time my old mat was sticky enough to hold everything including the tiny dog tags in place with no problem. If need be either spray your mat or your tags with repositioned spray glue…clean up is easy with a little googone. 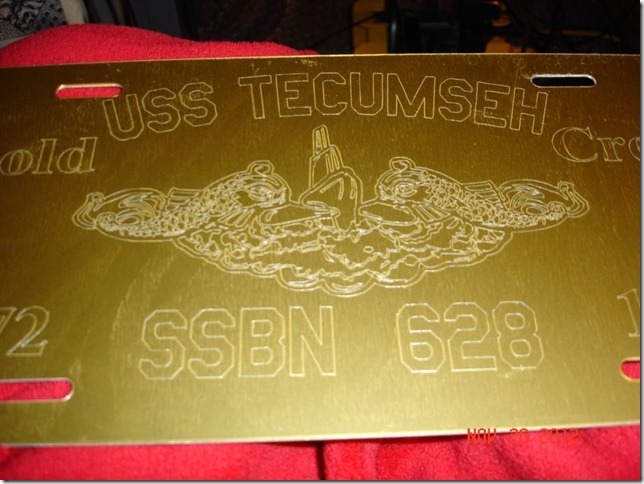 A few times I had the cut holes for the license plates in the wrong place and my design was over the holes, amazingly it didn’t matter, the engraving tip just kept on drawing. Onuoha the owner of the shop will do custom cuts, however it is real important you use the correct terminology. Tell him if you want the holes on the short side or the long side, this is an important thing to remember. He also loves drawing with markings. 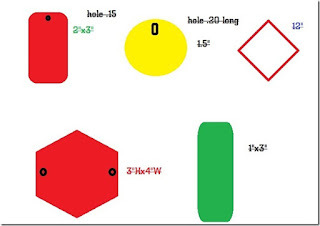 I used Paint and it was easy enough…you don’t have to make them to size but do type or print your sizes on the drawings and measurements for the hole placements, hole sizes how many and shapes…round or oblong. I will include my silly drawing to show you, you don’t have to be a graphic artist and he will understand. He also has color samples. I asked him to make them up, I know for one I want to see the color not guess off a computer screen. What can you do with this? What can’t you do with it, let’s see what you ladies come up with, let those juices flow. Knock some socks off. My brother actually came up with one idea, SS cards, he says he carries his and every few years he has to replace it. Now back in the early 70’s when I got married I did order mine in aluminum…he also mentioned Medicare cards…so making personal card, maybe even with a hole in it…??. I use to do jewelry and you really can do a lot with very little in the way of tools. A jewelry saw, some files, steel wool and emery cloth, tube of lipstick, soldering torch and a vice grip and it is amazing what u can do. 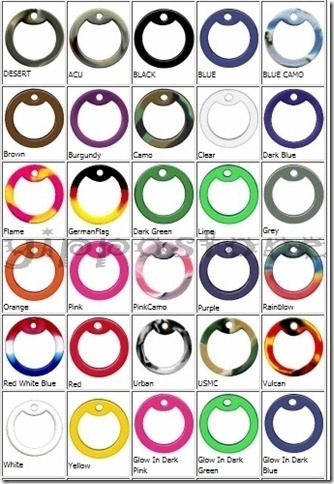 I will be working on making up some wrapped rings and name bracelets…and I want a Nanny necklace…lol. But I will get more into that much later. 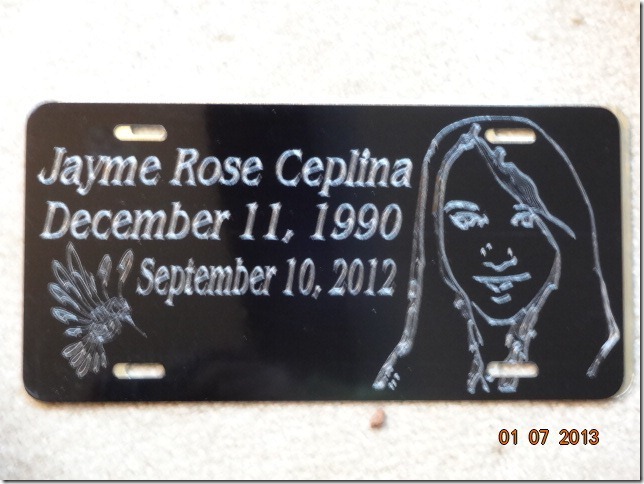 Pet memorial plates, Memorial plates in general, personalized car tags. Now I can’t put them on the front in NY so I purchased some suction cups that I can put on the back side window and hang the plate there. I am not even going to go into using this for vinyl…the options are endless. I am sure with time we will see it being used a lot. 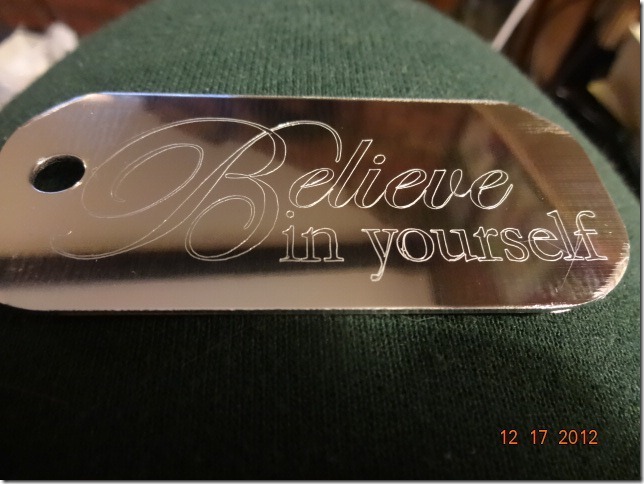 Some ideas I came up with license plates…some of these I have turned into engraved, and permanent markers are great too, but it has been suggest you spray over them with clear sealer. Thanks Karen! For all the time and effort you put into this!!! You have been amazing! 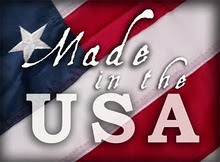 Don't forget to use the coupon code tag10 in the Chomas Creations store to save 10% off your purchase! Coupon good until the end of January, 2013. This would be a great idea for ribbon slide type medallions! That is the silver mirror from Ohax, the link is at the top! 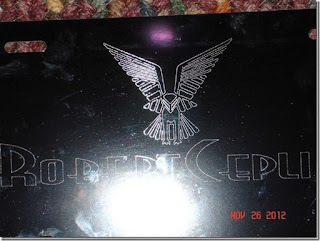 What did you use to do the actual engraving? I see what material was used but I mean the tool? Did you just use the blade that came with your machine or did you swap it with something else? I hope this makes sense. I'm just afraid the machine blade would be too flimsy and would get bent or broken. I'm very excited to try this! What are the cut settings? I bought an engraving tip but even when I use a simple font it adds lines to the tips of the letters? Or funky circles in the font. I put my blade on 10 and thickness 33. Are you kidding me?!?! This machine keeps blowing my mind! Just when you think you've learned it's limits something else comes up. Thank you so much for sharing! I'm not even sure when I would use this feature, but I need to think of something stat! What setting do you use for a Cricut Explore? There is no way to change the Explore engraver settings so you just leave them as is. Will this work for monograms on small metal discs? I was thinking of the 1" blanks. Thanks! Great post! 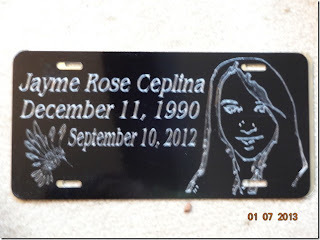 I never thought of metal tags with my silhouette until now. I'm totally buying some so that I can experiment. Thank you for the time and effort for trial and error. 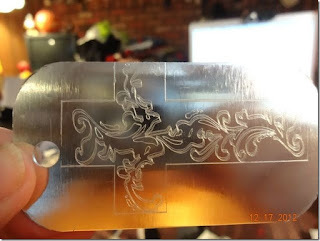 Ate there any tutorials for engraving? 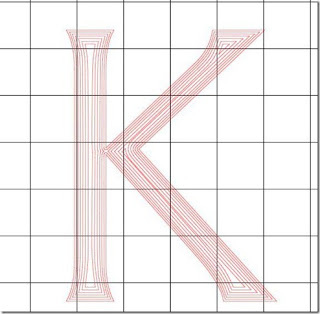 I love this tool but I can't get the any fonts to work right. How do you find fonts? Hi Amy, I bought one of your engraving tips and it says for silhouette but it is not fitting in the curio holders at all. Any idea why? We’ve googled everything and can’t seem to find any ideas for why or if we are doing it wrong. Disney/Pixar blog hop day 2!